There are plenty of resources to tell you HOW to perform various tasks with Configuration Manager. For that matter, there are multiple ways of doing many tasks. This session will use lessons learned from numerous Configuration Manager deployments to teach you WHY you would choose one method over another. This will be a broad, fast-paced session that digs into the questions you should ask to ensure you implement Configuration Manager the right way for your company. Ever wondered what impact deploying all of System Center could have on your business? Join us for a look at real world examples of two companies who did just that. We will look at the impact and value of implementing all of System Center 2012 Configuration Manager SP1, Operations Manager, Service Manager and Orchestrator. We’ll discuss business needs, process management, standardization, pain points and the importance of deployment order. The poster child for hierarchy simplification: 15000 systems, 70 locations, 23 Primary sites in Configuration Manager 2007…simplified down to a single primary in Configuration Manager 2012 while expanding ability to delegate management. This session include examples from new hierarchy design/simplification projects. Expect specific real world examples for how to keep your hierarchy as simple as possible. This was one of the slides from the second keynote at MMS last week. 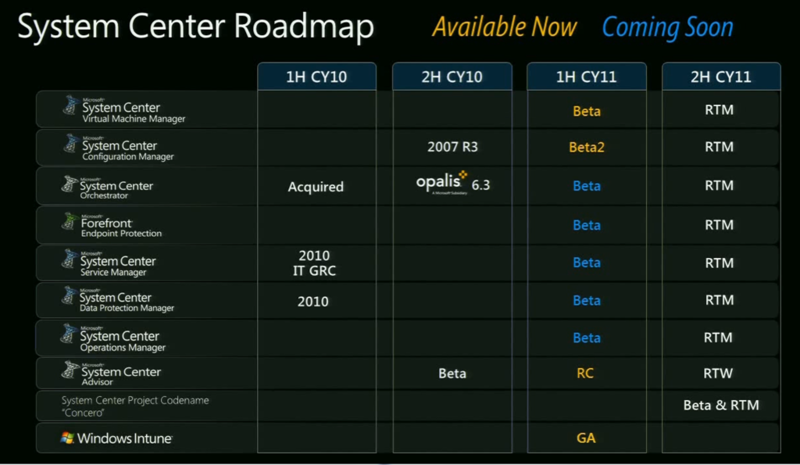 This is a slide they show every year to highlight what is coming in the System Center arena over the coming year. What is really exciting about this one is that a new version is coming for everything in the System Center family this calendar year. This is a lot of very exciting changes coming. This does come with a caution though…there’s a lot of work to be done ahead of time to be prepared for the launches! I’ve been putting together a proof of concept environment for Microsoft Application Virtualization (App-V), and ran across this error when testing app streaming. While at TechEd North America earlier this year, I had the pleasure of interviewing Mikael Nystrom from TrueSec. I knew very little about Mikael before sitting down with him, and it ended up being a very fun interview. It also ended up being over an hour long! Below is the first half of the interview. Enjoy! Just a note…the interviews from TechEd have been taking me a long time to post…mainly because of my frustration with some glitches with my blog host. I have had significant issues getting the audio to work. I have uploaded the audio in the format that is required by the audio player, but the player won’t play the audio. The previous interviews have each taken multiple hours to get the technical glitches worked out. This time I simply gave up on resolving the issues and produced a “video” from the audio and the one picture I have of me with Mikael at TechEd. Tonight was the monthly meeting for the Minnesota System Center User Group (miscusergroup.org – long story behind the URL MNSCUG.ORG). We had John Vintzel from the ConfigMgr product team talking about some of the features that will be in the R3 release…good stuff. A few weeks ago my friend Tim approached me to ask me if I would consider running for President of the user group. I was honored to be asked and said yes. Tonight I was elected to be President of the user group! That’s really really cool, and I’m looking forward to trying to get some good programs on the agenda for the meetings over the next year. BTW…if you are interested, the next meeting will be October 15th at the Microsoft office in Bloomington. Check the user group website above for more information. Lately I have been working on a SCOM (System Center Operations Manager) engagement for a client. During that engagement, I ran into some issues with the SCOM Gateway server which led me to KB948098. The “result” and “cause” sections are actually very helpful. The “resolution” section should have never been posted in its current form.…and it was posted over a year and a half ago. FYI…I already used the feedback form at the bottom of that page to leave this feedback. Hopefully this will help others who come across that article until Microsoft fixes it. As promised last week, here is the interview I had with Tim Mintner at TechEd North America in Los Angeles. Okay…it has been entirely too long since I’ve posted…over two months. Life has been a little crazy, but I finally cleaned up the rest of the Rod Trent interview to prepare it for posting. Hope you enjoy it. Also…I expect to post the next interview within another week or so…it is with Tim Mintner of the Microsoft Deployment product team! With as crazy as the last few weeks have been (traveling two out of three weeks to MMS and TechEd), I forgot to post about a webcast that I am going to be a part of tomorrow. I will be part of a joint webcast with Virteva (the company I work for) and Microsoft Consulting Services. The webcast is focused on desktop deployment and is designed more for the IT manager or decision maker…not necessarily for technical people…it will not be a technical webcast. I will be co-presenting with Steve Campbell from MCS. Rod Trent put up a post this week about the possibility of MMS being merged into TechEd. In my opinion this would be disastrous. Merging what is hands down the best event Microsoft sponsors into an already too big and too broad event would simply destroy all that is good about MMS. As part of Rod’s post he includes a poll so that we can let our voices be heard about this possibility. Please, visit Rod’s post and continue on to the poll. I came across this page recently that I found very helpful. It is a list of all of the possible error codes that the User State Migration Tool can produce. This can be very helpful in troubleshooting a USMT issue. USMT Error Codes on the Deployment Guys blog. I’ve been setting up a virtual ConfigMgr environment on my laptop to use both for demonstrating at client locations as well as to use for the demo portions of my presentations at MMS and TechEd. It’s running inside Virtual PC 2007, and the server VM is running Windows Server 2008 and ConfigMgr 2007 SP1 R2. It actually runs pretty peppy…I do have the VM running on an external 7200 RPM hard drive connected to my laptop via an eSATA cable. Anyway…I set up a Task Sequence to do my OS build and capture. It worked fine. Then I imported that WIM file and set up another Task Sequence to deploy that image. It was advertised to both the “All Unknown Computers” collection as well as a special OSD Deploy collection that I had created and imported the name and MAC address of the new VM into. After booting the new VM with the Bootable Task Sequence media CD, it kept giving me this error message: “Failed to Run Task Sequence” “There are no task sequences available for this computer.” If I looked in the smsts.log file located at “X:\windows\temp\smsts”, I saw an error entry stating: “No assigned task sequence.” Looking through the log file, I could see that it was reading the correct MAC address and had the right SMS GUID that was assigned to the system that I imported. So it was clearly recognizing the machine. It was talking to ConfigMgr correctly. It was downloading policy, but it was determining that none of those policies were applicable. 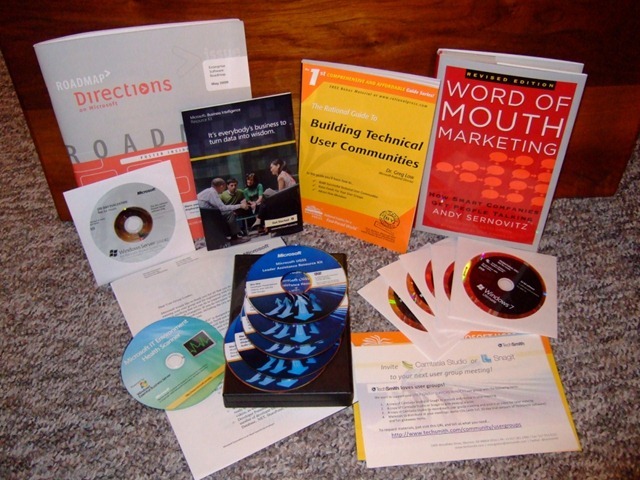 If I looked at the properties of either the Collection or the system, it showed that the advertisement for the Task Sequence was applicable to that computer. So…why would it show as applicable in the GUI, but not be evaluated as applicable during the task sequence? After beating on this for entirely too long, I finally figured it out this afternoon. I had done a housekeeping task on my VM to move all of the default “All…” collections off of the root of the Collections node (see this post). After doing so, I had forgotten to update those collections after “moving” them. Shouldn’t matter…except that the “All Unknown Computers” collection was completely empty…including not having the “x86 Unknown Computer (x86 Unknown Computer)” or “x64 Unknown Computer (x64 Unknown Computer)” entries. When the new VM was evaluating policy, it went through the following steps in the SMSTS.log. Setting site code = CM1. Setting client ID = 1b554c94-8eeb-490a-8b10-ae10bd579d3d. Because I had not updated the collection…and the “x86 Unknown Computer (x86 Unknown Computer)” resource didn’t exist in any collection…there wasn’t any advertisement that was applicable to that GUID. It behaved exactly like it should have. It just took me a long long time to figure out why it was failing. Once I updated the collection, the “problem” went away. In this instance, it was definitely a PEBKAC issue…Problem Exists Between Keyboard And Chair. 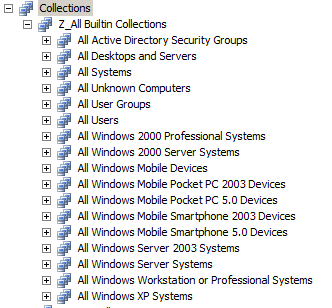 One of the little aspects of working in the ConfigMgr console that I don’t like is the number of builtin collections that are all at the top level of the collections node (“All Systems”, etc). I don’t like that they take up so much room at the top of the list (since they all start with the word “all”) and causes me to need to scroll/search in order to find the collections that I have created. I would prefer to have them in a folder (which doesn’t exist in the Collections area because of the way security works in collections). You will also note when right-clicking a collection, that there is not a “move” option. So…how do you do it? While you can’t create a true folder, you can use subcollections. Start off by creating a new empty collection named “Z_All Builtin Collections” at the root of the Collections node. After it is created, right click this “Z_All…” collection and choose New, then “Link to collection”. 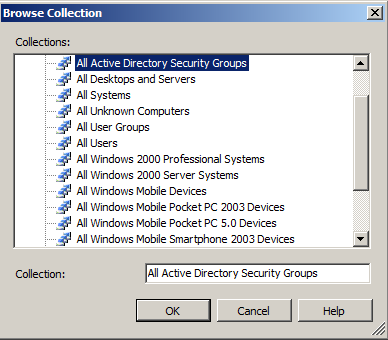 In the dialog that pops up (screen shot below), choose the topmost “All” collection which is probably “All Active Directory Security Groups”, then click OK. Repeat this process for all of the builtin collections. Make sure you don’t skip any of them. Once you do that, you will have the original collection at the root level and a link to that collection underneath the “Z_All Builtin Collections” collection. This link is an identical replica of the original…even down to the Collection ID. Now…go back to the original ones, right click it and choose “Delete”. This will bring up the “Delete Collection Wizard”. 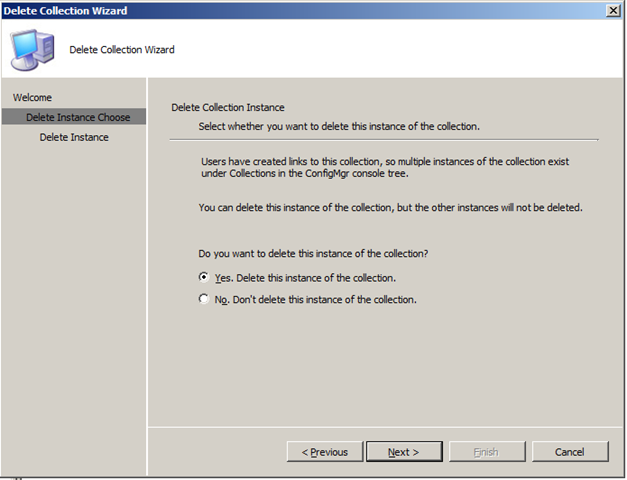 Click next, then note that this is a dialog for deleting an “instance” of the collection. You can delete the original instance while leaving the one that you created in the “Z_All…” collection intact. Repeat for all of the original ones. Now that you have done this, be sure to update all of these collections…you could run into problems if you don’t. More on that in my next post. Additionally this year you will receive a full copy of Windows 7 and Windows Server 2008 R2 when released to market as part of registration. Sweet! I had just been thinking about building a server for my home as a central place for my wife and I to store data as well as to have a powerful lab environment for me to learn on. 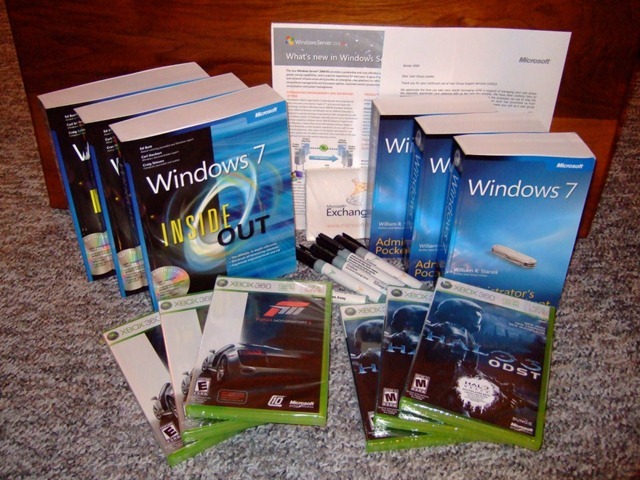 Now I will have a copy of Server 2008 to run it with along with a copy of Windows 7 to put on our home computer! One of the features of Word 2007 that I like is the “Full Screen Reading” mode. It really makes it easier to read/review a doc…especially a long one. Matter of fact…I do most of my editing in that mode as well. Most of the docs I work with are long, so pulling it up in full screen reading mode…(two pages on my 1920×1200 laptop screen) makes it easy to see where I am in the document as I am reading/editing. Definitely helps in maintaining the flow of the doc. Choose the Office “Orb” (top left corner of Word), then Word Options, then Customize, then click the Customize button to open the Customize Keyboard dialog box. In the “Categories” field, select “View Tab”. Then in the “Commands” field, select “ReadingModeLayout”. Click in the “Press new shortcut key” field, then choose what you want the new shortcut key to be. I choose Alt + F…hold down the Alt key and press the F key. This should show something like “Alt+F” in that field…then click “Assign”. That’s it. I now have my Full Screen Reading shortcut key.